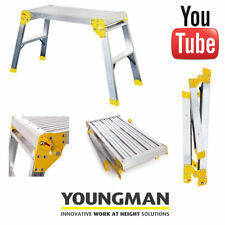 Youngman Low level Professional Work Platform. Platform height: 0.51m. Ladder Accessories. Compact - folds for easy storage. St Mary's Court. Trade specification. We have an even wider range of access products to view on our website. 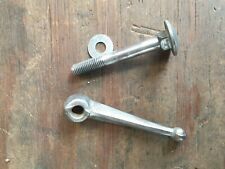 2 X youngman boss clamp bolt and wing nut for out riggers fits sp7 sp10 sp15. 2 wing nuSt and 2 boltS and washer.cleaned and thread rethreaded. perfect condition. Nos tours peut résoudre les problèmes d'accès presque tout!! Le 20-nov. -18 à 12:22:04 Paris, le vendeur a ajouté les informations suivantes 1 x instruction. 1 x échelle télescopique. 3.2m / 10ft5 (hauteur extensible). Matériau: alliage d'aluminium premium. Ladder stand off avec "v" - échelle stay-maintient votre échelle off the wall! Aluminium Ladder Stand Off With 'V'. Now With 'V' to enable ladder use on corners of buildings and against down pipes. 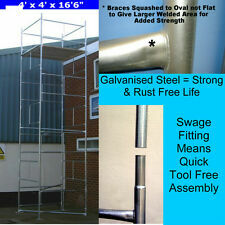 Scaffold Tower Accessories. Scaffold Towers. Lightweight Aluminium with rubber protection pads, is easy to fit and suitable for all ladders. Reachmaster Aluminium Tower Base Unit with Trapdoor Platform. Includes Castors (Non height adjustable). 0.6m Platform height - to give Approx. 2.6m (WH) 'working height' (reach height). Product features: The strongest and safest telescopic ladder which opens to the height you want up to 2.61m. Anti finger-jam feature for extra safely. Can only open from bottom to reduce foot-slip. Easily collapsed and transported or stored. Opens from 0.73m to 2.61m. Easy transport, high mobility. Adjustable to optimal height. Grid-Lock system. Easy to use, high safety. Light, compact and space saving. Transportation is easy and secure as the ladder is held by a transport belt. 2.5cm Safety distance between rungs to stop finger-pinching. Applicable everywhere. Technical information: 8 Steps. Length: 0.73 – 2.61 m. Width: 0.46 m. Carrying capacity: up to 150 kg. Certificates: EN 131-6 / GS. Autres accessoires Minimax disponible ici Minimax Accessoires. Comprend: - 2 x 2m 8 échelons cadres, 3 diagonales x, 4 x horizontales. Type Minimax. C’est un jeu que nous prenons très au sérieux ! Ladder Height 2m. Converts any single ladder into a roof ladder in minutes. This strongly made aluminium ridge hook assembly and nylon wheels will enable you to tackle roof work safely. Ladder Accessories. Scaffold Towers. Scaffold height 980mm. Multi-function ladder turns into step ladder, extension ladder, stair ladder or work platform. Weight 12kg 4kg platform planks. Building &. What do our. and service?. GRIP IT Fixings GASSORTKIT Heavy Duty Plasterboard Assorted Kit Contains 32 Pce (#182195472223). Toutes les hauteurs & Base tailles disponibles - consultez notre boutique maintenant ! GENUINE YOUNGMAN BOSS SP7/SP10/SP15 OUTRIGGER CLAMP COMPLETE;THIS HAS BEEN INSPECTED CLEANED ANY PART THAT NEEDED CHANGING HAS BEEN CHANGED.EXCELLENT ORDER READY TO FIT. Product features: The strongest and safest telescopic ladder which opens to the height you want up to 3.21m. Anti finger-jam feature for extra safely. can only open from bottom to reduce foot-slip. Easily collapsed and transported or stored. Opens from 1.03m to 3.21m. Easy transport, high mobility. Adjustable to optimal height. Grid-Lock system. Easy to use, high safety. Light, compact and space saving. Transportation is easy and secure as the ladder is held by a transport belt. 2.5cm Safety distance between rungs to stop finger-pinching. Applicable everywhere. Technical information: 11 Steps. Length: 1.03 – 3.21 m. Width: 0.45 m. Carrying capacity: up to 150 kg. Certificates: EN 131-6 / GS. Other Minimax accessories available here Minimax Accessories. Scaffold Towers. Scaffold Tower Accessories. We relish the opportunity of proving to you that we are THE BEST! We look forward to receiving your order soon. Heavy-duty warehouse steps manufactured from industrial strength aluminium. Fitted with non-slip treads, safety hand rails and cross braced frame for added strength and stability. Features large chequered top platform for extra grip and polyurethane wheels for easy manoeuvrability. Maximum capacity 150kg. Model No's WS8-WS14 supplied flat packed. Model No: WS5 Treads: 5 Platform Height: 1220mm Overall Size (W x D x H): 530 x 1070 x 1880mm Maximum Capacity: 150kg Weight: 11.3kg. 2 STEP MINI LADDER FOLDABLE KITCHEN SAFETY NONSLIP TREAD FOLDING STEPLADDER FOLD. FOLDABLE KITCHEN SAFETY LADDER 3 STEP NONSLIP TREAD FOLDING STEPLADDER FOLD NEW. Heavy Duty 4 Step Ladder Foldable Kitchen. The tapered, rubberised 'limb' of the LadderLimb fits easily into the side of the ladder, holding whatever is affixed to it safely in position. Working at different heights couldn't be easier - just pull out this modern LadderLimb bucket hook and insert into another rung on either side of your ladder. Heavy-duty warehouse steps manufactured from industrial strength aluminium. Fitted with non-slip treads, safety hand rails and cross braced frame for added strength and stability. Features large chequered top platform for extra grip and polyurethane wheels for easy manoeuvrability. Maximum capacity 150kg. Model No's WS8-WS14 supplied flat packed. Model No: WS8 Treads: 8 Platform Height: 1940mm Overall Size (W x D x H): 610 x 1470 x 2540mm Maximum Capacity: 150kg Weight: 15.9kg. Sherpascopic podium Plate-forme échelle télescopique: Toe Board, rambarde, Roues, etc. Can be used as a loft ladder. Extends rung-by-rung to the required height. What do our. and service?. © Qwikfast Trade & DIY Supplies Ltd 2017 - all trademarks remain the property of their respective owners. Heavy-duty warehouse steps manufactured from industrial strength aluminium. Fitted with non-slip treads, safety hand rails and cross braced frame for added strength and stability. Features large chequered top platform for extra grip and polyurethane wheels for easy manoeuvrability. Maximum capacity 150kg. Model No's WS8-WS14 supplied flat packed. Model No: WS7 Treads: 7 Platform Height: 1700mm Overall Size (W x D x H): 580 x 1300 x 2310mm Maximum Capacity: 150kg Weight: 14.5kg. Heavy-duty warehouse steps manufactured from industrial strength aluminium. Fitted with non-slip treads, safety hand rails and cross braced frame for added strength and stability. Features large chequered top platform for extra grip and polyurethane wheels for easy manoeuvrability. Maximum capacity 150kg. Model No's WS8-WS14 supplied flat packed. Model No: WS6 Treads: 6 Platform Height: 1450mm Overall Size (W x D x H): 560 x 1190 x 2060mm Maximum Capacity: 150kg Weight: 12.7kg. Type Youngman. Autres accessoires Minimax disponible ici Minimax Accessoires. MPN Minimax Guardrail. C’est un jeu que nous prenons très au sérieux ! Ajouter au vendeur favori. Liens utiles. --Découvre tout--. Rojak échelle bouchon Dispositif de sécurité 24"
The Stopper has been on the market since the early 1990's. Because of this the weight of the ladder and its user are spread throughout the Stopper over a large area. Designed using a heavy duty rubber plate to give extra grip at the feet of the ladder. Other Minimax accessories available here Minimax Accessories. Scaffold Towers. Scaffold Tower Accessories. We look forward to receiving your order soon. International Export. Offshore UK. Ladder Accessories. Heavy-duty warehouse steps manufactured from industrial strength aluminium. Fitted with non-slip treads, safety hand rails and cross braced frame for added strength and stability. Features large chequered top platform for extra grip and polyurethane wheels for easy manoeuvrability. Maximum capacity 150kg. Model No's WS8-WS14 supplied flat packed. Model No: WS9 Treads: 9 Platform Height: 2170mm Overall Size (W x D x H): 640 x 1630 x 2790mm Maximum Capacity: 150kg Weight: 17.4kg. Can be used as a loft ladder. Extends rung-by-rung to the required height. Rung spacing 270mm. Maximum extension 2.6m (8' 5"). 150kg capacity. Weight 6.8kg. Certified to EN131-6:2015. DIY Car Service Parts. Used Ladderfix Compact with rubber wheels. Higher reach. The ladder top projects up windows for a safe hand hold without resting against slippery sills. Dual action Safety. The Compact rests on walls or on top of sills for even higher. Youngman Odd Job Hop-Up Platform. Scaffold Tower Accessories. Scaffold Towers. PH43 (Rum). Platform Height - 0.51m. Large Platform - 700mm x 300mm. Ladder Accessories. Flooring Tools. Safety household ladder. Safety rail with bucket hook. Steel platform with non-slip ribbing and hinge spreader. Safe, high-tech riveted rail-step joins. Slip-resistant feet. Maximum load capacity: 150kg. 2 Scaffold Tread Plates. to form a stand, step ladder or platform ladder. Multi-position Aluminium Ladder. Can be used as normal step ladder and. Fire & Refuge. 3 points of manipulation, Lockable joints.